Giada De Laurentiis has me hooked on her Panna Cotta recipe. This dish is very light and a perfect pairing with fruit and chocolate. This recipe will be magnificent in the summer when fruits like peaches and nectarines are in season. Place the milk in a small bowl. Sprinkle the gelatin over. Let stand for 3 to 5 minutes to soften the gelatin. Pour milk mixture into a heavy saucepan and stir over medium heat just until the gelatin dissolves but the milk does not boil, about 5 minutes. Add the cream, honey, sugar, and salt. Stir until the sugar dissolves, 5 to 7 minutes. Remove from the heat. Pour into 6 glasses or bowls so that they are half full. Cool slightly. Refrigerate until set, at least 6 hours. 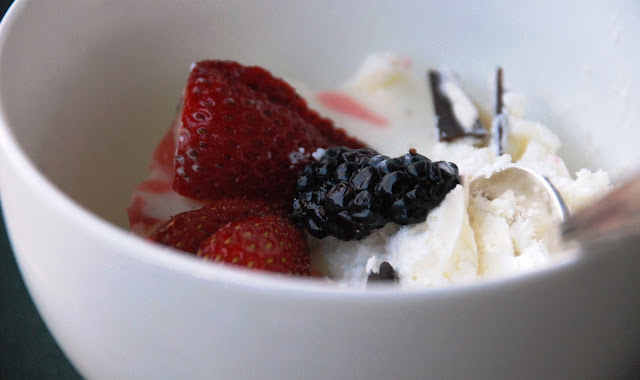 Spoon the berries atop the panna cotta with a piece of dark chocolate and serve. Guess Who Caught (or Shot) Me Dinner?